The asteroid (357439) 2004 BL86 was discovered (at ~ magnitude +18.6) on 2004, January 30 by Linear Survey (MPC code 704) with a 1.0-m f/2.15 reflector + CCD. Asteroid (357439) 2004 BL86 has an estimated size of 420 m - 940 m (based on the object's absolute magnitude H=19.0) and it will have a close approach with Earth at about 3.1 LD (Lunar Distances = ~384,000 kilometers) or 0.0080 AU (1 AU = ~150 million kilometers) on 2015, January 26 at 16:20UT. 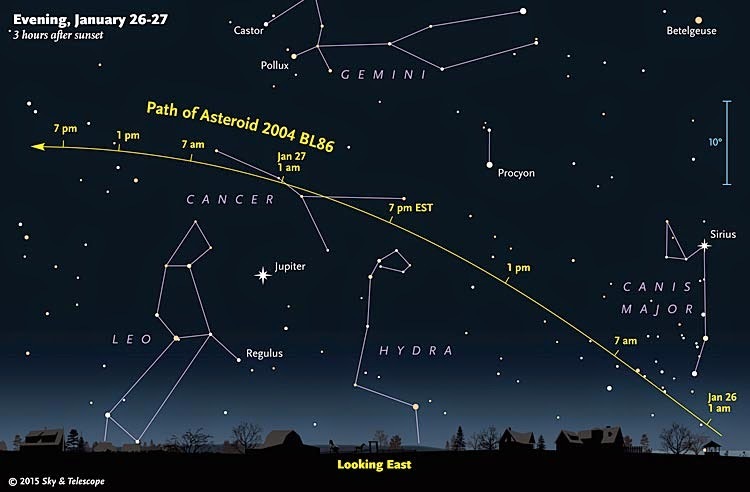 This asteroid will reach the peak magnitude about +9.0 between Jan 26 & 27. Astronomers at Goldstone will try to observe it "as the radar signal-to-noise ratios will be very strong and will provide an extraordinary opportunity to study this object". This flyby of 2004 BL86 will be the closest by any known space rock this large until asteroid (137108) 1999 AN10 (absolute magnitude H=17.9) flies past Earth in 2027 within one lunar distance. On April 2017, another asteroid "2014 JO25" (absolute magnitude H=18.1) will pass at about 4.8 LD from Earth. We performed some follow-up measurements of this object on 2015, January 23.4, remotely from the Q62 iTelescope network (Siding Spring, Australia) through a 0.43-m f/6.8 astrograph + CCD). Below you can see our image taken with the asteroid at about magnitude +15 and moving at ~ 10.51 "/min. The asteroid is trailed in the image due to its fast speed. At the moment of its close approach on Jan 26, around 16:20UT, (357439) 2004 BL86 will move at ~ 162 "/min (or about 2.7 deg/hour). Click on the image below to see a bigger version. (North is up, East is to the left). 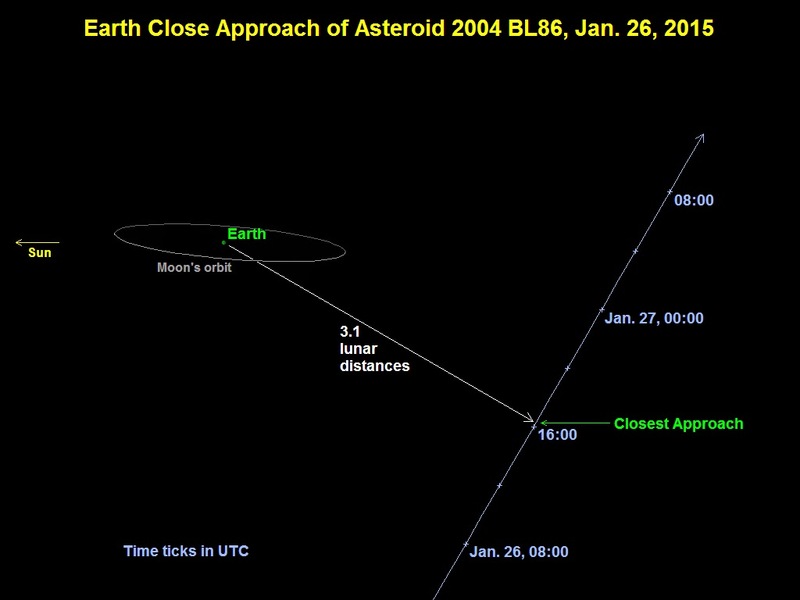 The graphic below depicts the passage of asteroid (357439) 2004 BL86 past Earth on January 26, 2015. The view is nearly edge-on to the Earth's orbit; the Moon's nearly circular orbit is highly foreshortened from this viewpoint. The asteroid moves from the south to the north, from below the Earth's orbit to above. Times indicated on the graphic are Universal Time. Click on the image for a bigger version. When 2004 BL86 will reach the peak magnitude +9 on the evening between January 26-27, it should be visible for several hours in small telescopes if you know where to look. The image below shows its path in the sky in those days. When brightest, it will be in the constellation Cancer. A more detailed map is available here. Scientists working with NASA's 70-meter Deep Space Network antenna at Goldstone, California, have released the first radar images of asteroid (357439) 2004 BL86. The images show that this asteroid has its own small moon. The signature of the satellite was seen in lightcurve data reported earlier by J. Pollock (Appalachian State University, North Carolina) and P. Pravec (Ondrejov Observatory, Czech Republic) and then confirmed by radar. "The primary body is approximately 325 meters across and has a small moon approximately 70 meters across. In the near-Earth population, about 16 percent of asteroids that are about 200 meters or larger are a binary (the primary asteroid with a smaller asteroid moon orbiting it) or even triple systems (two moons). The resolution on the radar images is 4 meters per pixel." Below you can see the animation made by using 20 radar images obtained at Goldstone and showing asteroid (357439) 2004 BL86 and its moon. Click on the animation to see a bigger version. 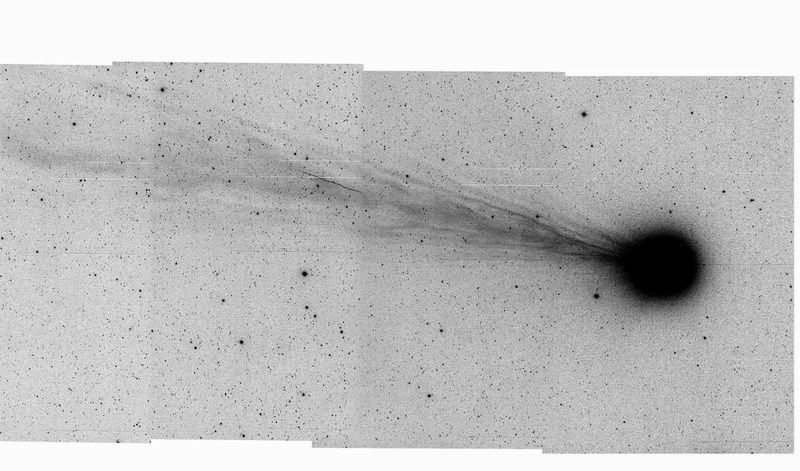 Comet C/2014 Q2 (Lovejoy) was discovered (at magnitude +14.8) by T. Lovejoy (Birkdale, Qld., Australia) on 17 August 2014 on CCD images obtained with a 20-cm f/2.1 Schmidt-Cassegrain telescope. 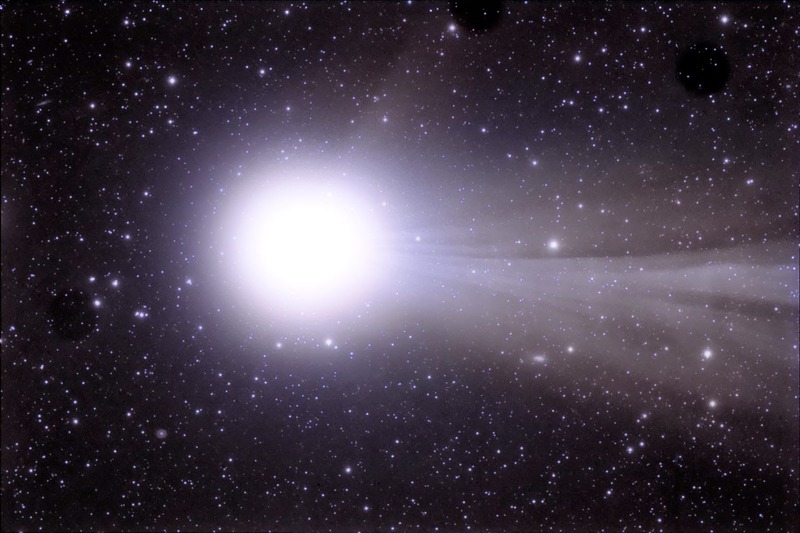 It is the fifth comet discovered by Terry Lovejoy. On 7 January 2015, comet C/2014 Q2 passed 0.469 AU (1 AU = ~150 million kilometers) from Earth and it will reach the perihelion (closest approach to the Sun) on 30 January 2015 at a distance of 1.29 AU from the Sun. Comet Lovejoy reached few days ago its peak brightness at about magnitude +3.8, as bright as it should get, making it a naked-eye object. It is currently still at about magnitude +4.3. See below an updated light-curve. 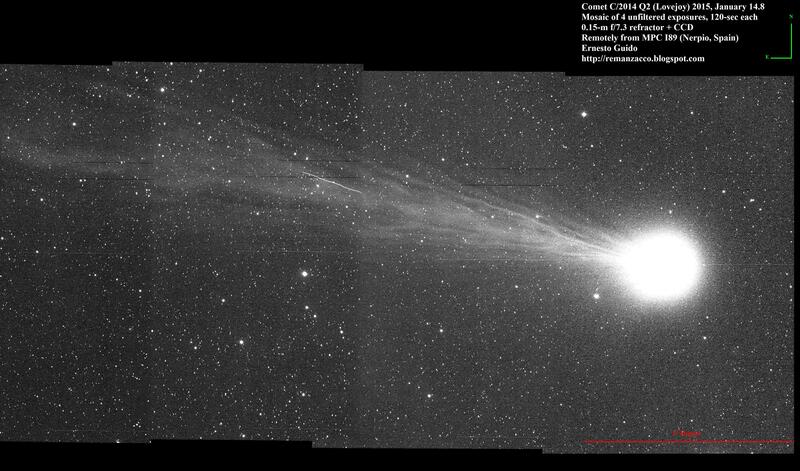 Below an image of comet C/2014 Q2 taken on 16 January 2015. Click on it for a bigger version. 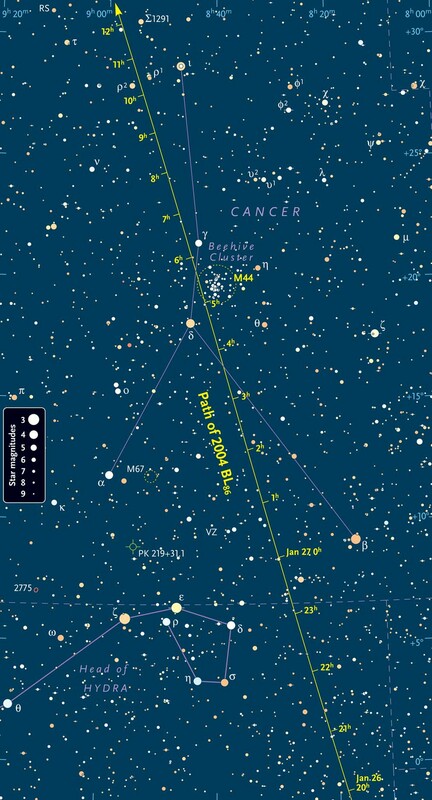 Below a finder chart to help you locate this comet during January 2015. The dates are in Universal Time; the ticks are at 0:00 UT. Click on it for a bigger version.